scapos CEO Guy Lonsdale talked to Primeur Magazine on the recently launched EU project FocusCoE and the role of the EU HPC CoEs (Centres of Excellence) in the EU HPC strategy. 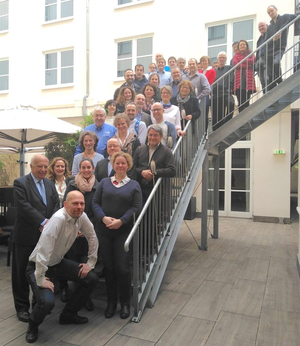 scapos leads the recently started Horizon 2020 project FocusCoE, running from 1.12.2018 until 30.11.2021. This project supports the activities of the EU HPC centres of excellence (CoEs), which develop key applications for the next generation of supercomputers in the Exascale range (one Billion Billion = 1018 operations per second), supporting the goal of the EU to establish a leading and independent European HPC ecosystem in the Exascale era. Applications are an important pillar of that strategy, complementing hardware technology development and deployment of HPC systems. OptoInspect3D Inline Version 2.6 was released in December and is now available. This new version includes a number of functional and performance improvements and several new features. OptoInspect3D Inline at VISION 2018, 06.-08. November! Packaging Software PackAssistant and PUZZLE® FachPack 2018! Making the best use of container space can save both, transportation and storage costs. One simply needs to find the right way to arrange the objects to be packed in the available container space. Experienced packing planners usually spend a lot of time meticulously arranging and packing parts with complex shapes but, nevertheless, they will not, in most cases, achieve the same packing density as realized with PackAssistant.The PackAssistant software calculates the optimal packing arrangement of identical parts in standard containers by using 3D designs (CAD). This also works for parts with complex shapes, as the software will identify and take the individual shape of the object into account. PUZZLE® has been optimizing the space of boxes and pallets since 1992. Numerous companies have already used licensed versions of the software, developed by the Fraunhofer Institute for Material Flow and Logistics, and benefited from the more efficient allocation of shipping space. PUZZLE® not only calculates the most optimal arrangement of geometric objects in a defined space but it also helps the user select the right loading equipment for the job. OptoInspect3D Inline Version 2.4 was released in July and is now available. This new version includes a number of functional and performance improvements and several new features. One of the most important new features is the improved numerical stability and accuracy of the Minimum Zone computations using Chebyshev approximation methods. In collaboration with Fraunhofer IFF scapos will present the new software library OptoInspect3D Inline at the Control 2018 trade-fair in Stuttgart, from April 24th to 27th. You can find us at the Fraunhofer Alliance “Vision” booth (Hall 6, booth 6302). Free day passes are available here. We are looking forward to meeting you at booth 6/6302. scapos CEO Guy Lonsdale talks to Primeur Magazine about the company and its HPC-related products and on the general context of EU R&D project activities that promote the broader take-up of HPC and prepare the technology for exascale computing platforms. In collaboration with Fraunhofer IFF scapos will present the new software library OptoInspect3D Inline at the Control 2017 trade-fair in Stuttgart, from May 9th to 12th. You can find us at the Fraunhofer Alliance “Vision” booth (Hall 6, booth 6302). Free day passes are available here. New Product for processing measurement data: OptoInspect3D Inline. scapos has extended its product portfolio in the area of digital manufacturing and Industry 4.0: the C++ library OptoInspect3D Inline, which is developed by the Fraunhofer Institute IFF in Magdeburg. The software library processes 3D data sets so rapidly, that the inspection of components – for example the comparison with an optimal CAD geometry or the verification of specific geometric characteristics – can be automated and integrated in the manufacturing chain. Instead of inspecting only some statistical samples, every manufactured part can be examined and validated. The integration of OptoInspect3D Inline into customized process chains is flexible: independent of the digitalization technique used (e.g. structured light 3d scanners, light section or laser scan) the different methods can be combined as needed. The new CAE tool ModelCompare – developed by Fraunhofer Institute SCAI – provides a fast and easy comparison of different Finite Element models. Currently, the tool is available as an Animator plug-in but can be adapted to other pre- and post-processors. ModelCompare portrays differences regarding discretization, material-ID and thickness, independent of the assigned part ID or the names of the components. It uses specialized mapping techniques that result in extremely short run times. Fraunhofer SCAI will present the new product, in addition to the latest developments for MpCCI (LINK), at the VDI SIMVEC conference in Baden-Baden on 22nd and 23rd of November, 2016. Typically, LAMA targets applications with needs in numerical mathematics (such as CFD and FEM simulation). Furthermore, LAMA 2.0 integrates methodology in the areas of optimization (e.g. for seismic imaging), computer vision, and deep learning. It is available with an industry-friendly dual licensing model (AGPL for open source or individual agreements for other interests). Fraunhofer SCAI publishes with LAMA 2.0 the next evolution of its high performance computing framework. It has grown from a linear algebra library to a multi-purpose programming framework. By offering DSL-like C++-Syntax LAMA encourages writing of hardware-independent code. The framework allows the management of data on heterogeneous and distributed system architectures. These can range from embedded “System on a Chip” (aka SoC) devices to highly-parallel Supercomputers. Consequently, LAMA offers full cluster support. Kernel management is provided with ready-to-use modules encapsulating interfaces to Intel® MKL and Nvidia® cuBLAS/cuSPARSE (targeting all multicore CPUs, Nvidia® GPUs, and Intel® Xeon® Phi™). For the purpose of extending LAMA, the framework supports the integration of custom modules. Hence, it greatly facilitates the development of fast and scalable software for nearly every system on every scale. LAMA accelerates the time-to-market for new product developments significantly, reduces the time spent in maintaining existing code, and offers up-to-date hardware compatibility for even the latest architectures. Meet us at Eurotox fair in Sevilla! From 4. - 7. September 2016 scapos will join the Eurotox fair in Sevilla and show its new product in the area of In-Vitro Technologies – the ExpoCube! Meet us at ISC 2016! scapos AG will continue its presence at the ISC series as co-exhibitor at the ISC 2016 conference and exhibit in Frankfurt (June 19 – June 23, 2016). We will present HPC-related software products and introduce HPC- Cloud R&D funding opportunities, targeting engineering & manufacturing SMEs, arising in the EU H2020 Project Fortissimo 2. Meet us at booth 818! We were immensely pleased to receive two HPCwire awards at the recent SC'15 event in Austin, Texas. 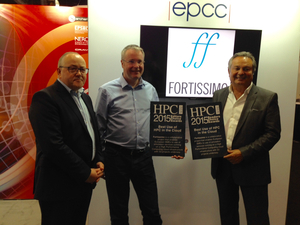 Fortissimo was given both the Editors' Choice Award and Readers' Choice Award for Best Use of HPC in the Cloud. Packaging Software PackAssistant and PUZZLE® FachPack 2015! PackAssistant: fast and optimal container load Planning! Making the best use of container space can save both, transportation and storage costs. One simply needs to find the right way to arrange the objects to be packed in the available container space. Experienced packing planners usually spend a lot of time meticulously arranging and packing parts with complex shapes but, nevertheless, they will not, in most cases, achieve the same packing density as realized with PackAssistant.The PackAssistant software calculates the optimal packing arrangement of identical parts in standard containers by using 3D designs (CAD). This also works for parts with complex shapes, as the software will identify and take the individual shape of the object into account. More! PUZZLE® - Software for the Palletization!